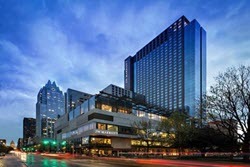 The JW Marriott Austin hotel brings an unparalleled upscale hotel experience to downtown Austin. 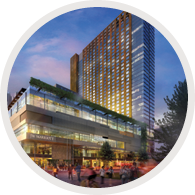 Situated in the heart of the city, our sprawling urban resort features the largest guest rooms in Austin, TX with floor to ceiling windows, 7 bars, 3 restaurants, Starbucks, the posh Spa by JW, the brand new Edge Pool Bar & Cabanas, and the ever-popular Burger Bar, our food truck without wheels. JW Marriott Austin is a 2018 TripAdvisor Certificate of Excellence Award winner and only a 15-minute drive from Austin International Airport and just steps from the best attractions and entertainment options Austin has to offer – including the Sixth Street Entertainment District, South by Southwest Music Conference and Festival, Austin City Limits Music Festival, University of Texas and the Texas State Capitol. Our Austin hotel features more than 120,000 square feet of flexible meeting and event space and easy access to the Austin Convention Center – just two blocks away.